Here are some updates to previous posts, mostly regarding tools. Since the original posts appeared, I’ve had the time to accumulate experience with additional tools, incorporate modifications to tools, or have additional ideas about their function. Rust Busters, January 15, 2009, discussed helpful rust prevention products. Shortly thereafter, I installed Zerust drawer liners in my tool cabinet drawers. These look and feel like non-slip router mats but contain corrosion inhibitors which work invisibly and odorlessly. The gripping effect of the mat prevents tools from sliding, bumping, and rattling when the drawer is opened and closed. A 1 x 6-foot sheet costs $8.95 and protects up to 5 years according to the package label, 2 years according to the website. A definite winner. Dovetail Chisels, September 28, 2008. Opinions vary because there is more than one good way to do almost everything in woodworking, but I still find it helpful to have a set of narrow chisels with side relief to clear the waste between tails. My Japanese chisels for this purpose are more than 20 years old. 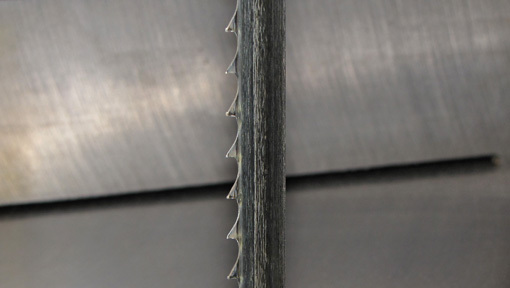 Bob Zajicek of Czeck Edge Tools has addressed this issue by producing a chisel design with side bevels that directly meet the back at a 70̊ angle, and have a one degree taper along the length to further reduce binding. I have not tried these but it looks like an excellent design and they are doubtless as meticulously crafted as the other products by Bob that I have tried. 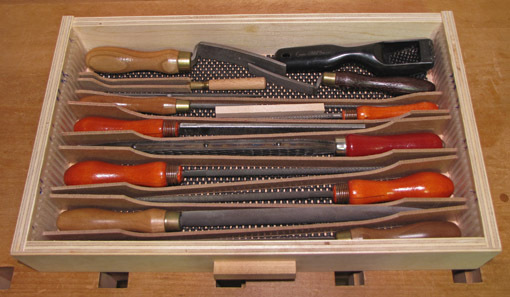 Other options to consider are the Ashley Isles round back dovetail chisels sold by Tools for Working Wood. More Workbench Upgrades – Pups, Anchors, and Stops, December 2 and 6, 2009. The longer I used these helpful additions to my workbench, the more it became apparent that the Veritas Wonder Pups would provide even greater versatility to the wood-holding repertoire. I put thin PSA cork on the clamping faces. They are now part of the team and are clear winners. 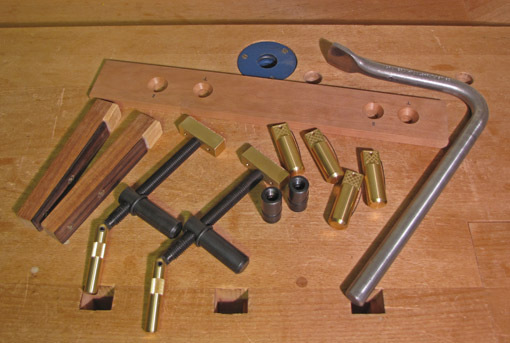 Ditto for the Gramercy holdfast, and the bench already has several of the required 3/4″ holes. This tool is as good as it gets in combining simplicity and effectiveness. I think a piece of modern abstract sculpture can now be held securely on my workbench. Bandsaw, Hand Tool With a Motor, June 15, 2010. In response to a reader’s question, I noted that I do my bandsaw work with just two blades by Suffolk Machinery, a 3/4″ wide, 2/3 tpi variable pitch blade for resawing and other straight cuts, and a 3/8″ wide, 6 tpi blade (see the Comments section of the post for more details.) I still think they are superb blades. Lately, I have been using the SuperCut’s Premium Gold ½” wide, 3 tpi blade which has bone-chillingly sharp carbide-impregnated teeth. I was skeptical that the ½” width would be sufficiently stiff for resawing. I still need more experience with the blade, but so far, so good. The handy benefit is that I can also cut my usual shallow, sweeping curves with this ½” blade which comes with the back smoothly rounded. This usually saves me from one of the most unpleasant jobs in the shop: changing bandsaw blades. More “second thoughts” to come in a future post. I’m always learning more about this craft and enjoy doing so. 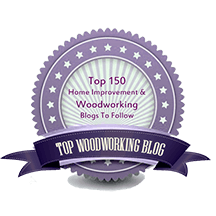 I hope this information is helpful to you for your woodworking. This wood is so beautiful, varied, and agreeable to work with, that I imagine if I could have only one species of wood to use for everything, it might well be Claro walnut. It is so captivating that there is a real temptation to just join a few pieces corner to corner without any thought to a real design, state that “Woodwork is made by fools like me but only God can make a tree” (apologies to Joyce Kilmer), and leave it at that. If there are doubts about this wood, it is only in being sure of its proper scientific label. Perhaps oversimplifying, Claro walnut is Juglans hindsii, native to northern California. 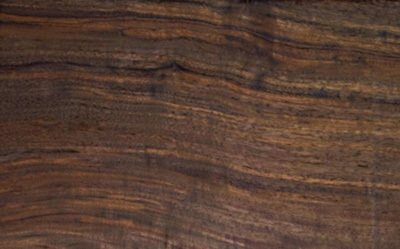 The well-known Eastern (U.S.) black walnut, a great wood in its own right, is Juglans nigra. As best I understand, “Claro walnut” lumber may come from trees that are J. hindsii or a hindsii x nigra hybrid, or from the hindsii root stock upon which Juglans regia, English walnut, has been grafted. Botanical technicalities aside, it’s just gorgeous wood. Claro’s strongest appeal to me is in the variety of rich colors that can be found mingled in a single board, most compellingly on a marbled quartered or rift surface. Even more spectacular, curly figure, delicate or ropy, may be superimposed on the marbled color array. Flatsawn boards are very often too gnarly for my taste, but certainly have their own appeal. Crotch figure is also available. 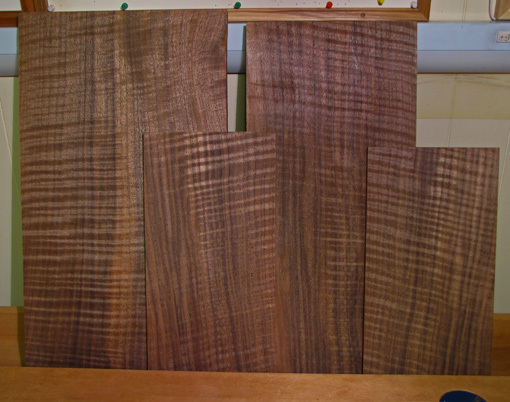 The working properties of Claro are much like black walnut: excellent. It is a medium-hard wood, pleasant to work but with enough surface hardness for any furniture item. Sawing, joinery, and gluing are almost always without problems. Layout lines can be difficult to see but angling a light source can pick up the glistening of a graphite line fairly well. White art pencils blunt quickly but can be helpful for less critically precise layout. The wood responds well to hand planing which gives an exciting clarity to vertical grain (quartered) and most rift surfaces. It can sometimes be a bit brittle under the plane. If you like swirly boards, scraping works better. For finishing, varnish and oil-varnish mixes have worked well. Shellac is another good option; water base is not, in my opinion. The stability figures for Claro are very favorable and this is my shop sense as well. According to The Wood Database, Claro shrinkage is 4.3% radial, 6.4% tangential, 10.7% volumetric, and T/R is 1.5. Quartered boards, as expected, are very stable. Here on the East coast U.S., I purchase Claro from across the continent so it is particularly important to buy from a dealer on whom I can rely. As for big-leaf maple, Northwest Timber in Oregon is my first choice for Claro walnut. 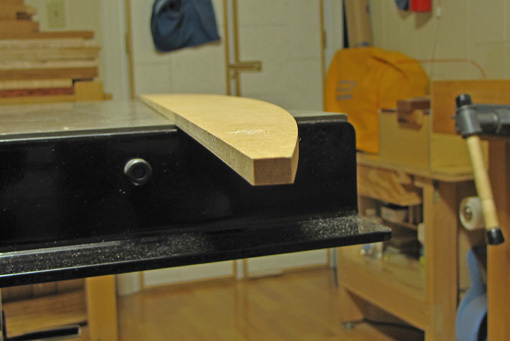 In nearly all of my woodworking projects, there are curves that can make or break the design. These are almost always curves without a constant radius, so I am relying on what looks “right” to my eye. I really sweat this aspect of the design process. Acu Arc flexible curves are my favorite tools for laying out curves. French curves in regular and Woodhaven’s giant sizes are also helpful for sections of curves. I do not like flexible rules or laths for laying out curves because it is awkward or impossible to control the contour in mid-curve. The curve is determined by the endpoints and at least one intermediary point and is then subject to the material properties of the layout device which may not produce the desired contour. I rarely use trammel points or a compass. To design curves in a project, I start by gathering ideas and drawing in my sketchbook. I refine the promising sketches with scale drawings, repeatedly erasing and redrawing. To produce a full size mock-up, the results get transferred onto wood by measuring the key points and laying out a smooth curve using the Acu Arc. Sometimes I go from sketches to drawing directly on the wood. The mock-up is refined with spokeshaves, planes, and especially rasps. I spend a lot of time looking at the mock up, leaving it, and returning to see how it strikes me at repeat visits. The bottom line: when it looks right and feels right, it is right, and that is a happy woodworking moment! I transfer the key dimensions of the mock-up and drawing to make a template in quarter-inch MDF, using the Acu Arc again to refine the final layout. MDF works better than plywood, solid wood, or cardboard since it holds a clean edge and there is no grain to distract my eye or tools. The edges of the template should be square if it will be used on both faces for legs or as a template for router work. Looking down the curve, as shown in the photo below, is a remarkably sensitive way to see bumps and lumps that must be eliminated to “fair the curve.” Running one’s hand along the curve, like a sleigh ride over the hills, is also a very good way to sense smooth transitions and detect lumps and bumps which must be removed. The Acu Arc has a natural tendency to produce a curve without bumps as you shape it to your wishes. Then you can hold it on the wood, and trace only a nearby section of the curve with a pencil, hold it further along, trace more, and so forth, proceeding incrementally. It is stiff enough to hold its shape when it is carefully lifted and turned over to form the mirror image curve on the adjacent face, as is usually done for making legs. It is made of translucent colorless plastic but I would prefer opaque plastic that would show the curve better against the background of the wood. I label the templates, save them, and sometimes reuse parts of them in other projects. In due time, a style develops, and, who knows, maybe someone will notice. First, the bad news. Pearwood (genus Pyrus) is difficult to dry without distortion and the lumber often contains large splits, knots, and other defects. It is expensive and hard to find, especially in large pieces that are not loaded with defects. But oh, the good news! Pear has a dreamy fine-grained, silky-looking texture with understated but exciting color. The best I can do in words is to call the color a muted pink/salmon, sometimes a pinkish brown. 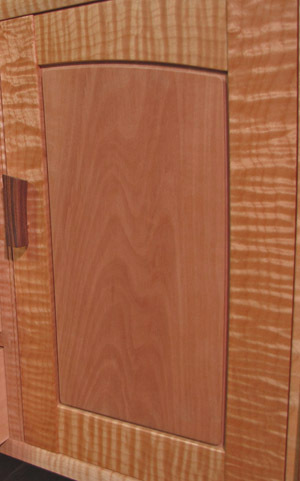 Almost all commercially available pearwood that I have come across has been steamed during processing to enhance the color and reduce stresses in drying. The domestic pear that I have bought locally has tended to be fairly uniform in color with little or no curl figure, and a density not much greater than cherry or walnut. 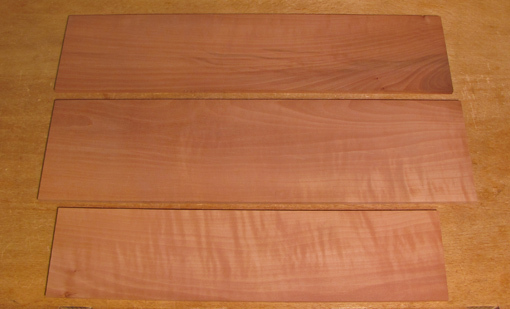 The top photo below shows a pair of pink-salmon boards from the same tree. Note the subtle shimmer curl in the front board. The lower photo shows a board from another tree which has interesting purplish red streaks. All of the wood shown in this post is from my shop. It has been surfaced only by the thickness planer with the exception of the door panel in the photo at the end of the post. The photo color is very close to real and close as I can get. Some pieces are portions of boards purchased over 15 years ago. Please keep in mind that I am writing these posts based on my personal experience with the wood, and, since pear is particularly variable, others woodworkers will surely have different experiences. Pear is one of those woods that, if I see some excellent stock in person, I’ll buy it even if I do not have any immediate plans to use it. I know its time will come. I have a pile of German pear that is much denser, has deeper color, and more streaks and figure than the boards above. I resawed all of it and it took a long time, at least several weeks as I recall, to settle out of its tendency to distort. Three examples from that lot, pictured below, show a range of color, streaks, and curl. Beautiful! Once at peace, all the pear that I have used has been well-behaved and quite stable. I have not been able to find shrinkage data. Pear is not problematic to saw or glue. Its beautiful fine texture demands a hand-planed finish. The blade must be at peak sharpness with a carefully cambered edge because any blade defect will show up prominently on the wood surface. I needed a bevel-up smoother with a high attack angle for the German pear. Likewise, in cutting joints, pear reveals any and all boo-boos. Finishing pear is a study in “less-is-more.” Oil or varnish, in my opinion, kills the wood giving it a greasy look. No finish or just some wax would work. To get more protection, I prefer a water-base poly-acrylic which imparts as little change in color as possible and preserves the lively look of the wood. Enjoy and good luck with pearwood if you decide to use it in your work.